Waste can be a byproduct of industrial processes - or an item can become waste after it's been consumed. Waste - be it plastic, micro-plastic, radioactive, or otherwise toxic - can cause major environmental problems. DW presents an automatic compilation of content around the topic of waste. Two young game designers from Ghana want to tackle e-waste with "edutainment." They’re developing an augmented reality game that takes players right to the heart of Ghana's e-waste problem. Tech activist and experience designer Bethlehem Anteneh says residents of Accra, Ghana, have come to see the appalling levels of digital waste in their city as normal. Her augmented reality game Chronicals of Klinu helps proves that's not so. "When you are playing a game, you are in a whole new world," she says. 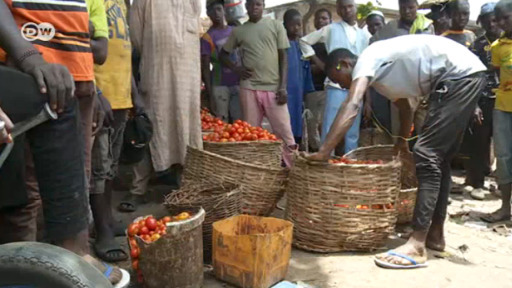 Nigeria’s climate is perfect for tomato production - but around half of it goes to waste due to lack of refrigeration and transport facilities. So the country is heavily dependent on tomato imports and local farmers struggle to survive. Doodlage in New Dehli makes clothes out of scraps of fabric and second-hand garments. Creative director Kriti Tula dreams up new designs. The company sells its wares in 30 shops and online. When was the last time you scrunched a piece of paper into a ball and threw it into the trash? Next time, why not get creative instead? That's exactly what Nigerian artist and entrepreneur Funmi Abudi did - managing to create a business along the way.